We invite you to explore our website and see what is available at Luther Village. Then schedule a tour of the community to see for yourself. We are delighted with your interest in Luther Village. Planned as a residential community for active people 55 years of age and older, Luther Village was designed to allow individuals to live graciously with maximum independence along with available services throughout their retirement years. Luther Village was established in residential Arlington Heights in 1990 by the Shaw Company. 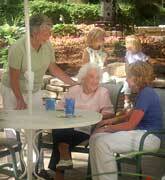 It has the distinction of being the first full-equity ownership retirement community in the Midwest. Residents of Luther Village own shares in The Luther Village Owners’ Corporation and enjoy the financial advantages that go along with owning shares in a co-op. Another benefit to residents of Luther Village is the comfort and convenience of having a highly respected and well recognized health care provider on the same campus, The Lutheran Home. Residents of Luther Village have first priority access to The Lutheran Home for re-hab and their health care needs. At Luther Village you get so much more. The community is designed to provide active seniors with services and amenities that increase their independence and freedom. A la carte services are available for laundry, housekeeping and handyman services. There are also a wide range of services and social activities that are available to each resident, including snow removal, landscaping, fitness center with an indoor pool, classes, entertainment, off-campus trips and so much more. Visit our Choice of Services page for a complete list. The campus offers 55 acres of mature landscaping with walking paths surrounding lovely ponds. There is also a fishing pier, raised-bed gardens, and a cozy Summer House for entertaining and special outdoor activities.